It takes guts to write a fictitious novel about the Mona Lisa. Not only focusing on the world’s most famous painting and preserving its historic authenticity in a story that never happened. And then celebrating it along with the legendary French Resistance in Nazi-occupied Paris. But sustaining such a story without the whole thing collapsing into some literary farce? 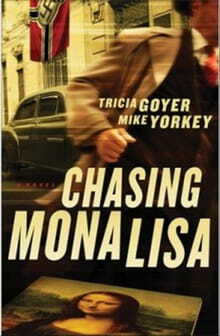 Yet authors Tricia Goyer and Mike Yorkey make a heroic effort at doing so in Chasing Mona Lisa. Replete with admirably-researched narratives, this fast-paced thriller through the streets of Paris during the Germans’ final hours there is a bona fide page-turner. Defiant Resistance fighters set the stage, intent on reclaiming their beloved capital after four years of lethal intimidation by the Nazis. Meanwhile, notorious Reichsmarschall Hermann Göring, aware that Germany’s imminent retreat from France spells the end for his pillaging of Europe’s prized cultural masterpieces, commissions one last barbaric act to secure his post-war options. These two epic showdowns unexpectedly cross at the iconic Louvre, of all places, whose curator for the Mona Lisa stands between Göring’s henchmen and her own boyfriend, a leader in—what else?—France’s Communist resistance. Ahh, yes, this is France, after all. And what would a story set in Paris be without a dollop of romance? Plus un petit de anti-capitalist politics? If you’re a particularly forgiving reader, you’ll excuse one unfortunately flimsy twist toward the end of this harrowing tale, which were I to elaborate further could blow the climax for you. Suffice it to say that I highly doubt the French would have risked exposing such a young person to the grievous threat Goyer and Yorkey craft for her. Still, the authors’ overall allegiance to authentic historic touchstones, from the Mona Lisa’s actual theft in 1911 to surprisingly robust infighting among France’s Resistance factions, helps prevent most suspensions of credibility. Granted, the very idea that stealing the Mona Lisa could hold such pivotal significance in World War II may baffle anybody unaware of Nazi Germany’s fixation not just on winning battles, but confiscating great works of art. Frankly, the first I learned of such subterfuge was during an episode of the classic TV show Hogan’s Heroes, where Corporal Louis LeBeau helps foil a shipment of purloined art. Only it wasn’t anecdotal. Actually, instead of being a trivial aspect of the war, it helps explain the Nazi mindset. In Chasing Mona Lisa, Goyer and Yorkey go beyond their story to validate how Nazi leaders displayed utter contempt for other European cultures by forcibly cornering the international market on fine art. You might also recall that using cultural icons as pawns of war occurred as recently as Egypt’s Arab Spring. And during the Iraq War’s early days, leaders from around the world chastised Americans for letting looters plunder priceless artifacts from museums in Baghdad. Fortunately, you can still be an artistically-challenged American and appreciate the intensity running throughout Chasing Mona Lisa. Because in the end, it doesn’t come down to the piece of art, as much as it does the extent to which committed people will fight for something. Even if that something is their personal survival. Chasing Mona Lisa is not an exclusively Christian novel, and what little theology it references is, unfortunately, open to interpretation. But if you like purposeful action, justice, and a legitimate history lesson along the way, without gratuitous explicitness, you won’t be disappointed with what Goyer and Yorkey have cooked up. Even if it gets a little soupy from time to time.